1. A soft, non-abrasive substrate for all types of reptiles. 2. Absorbent, pulling waste away from the surface and the tender belly of your reptile. 3. Better than non-absorbent astro turf type carpets, which are made of plastic and can irritate the animals underside, ultimately leaving the animal susceptible to bacterial build up and infection. 4. Comes two per package for easy cleaning maintenance. 5. Great for use as a protective layer when using the Reptitherm U.T.H. and loose substrates (i.e. Repti Bark, Repti Sand or Terrarium Moss). 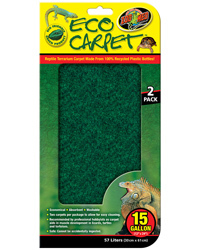 Eco Carpet was previously known as Repti Cage Carpet. "Many thanks for the quick delivery on my product, your service is fantastic I will be using you again in the near future, I will also be telling my friends about you, many thanks."